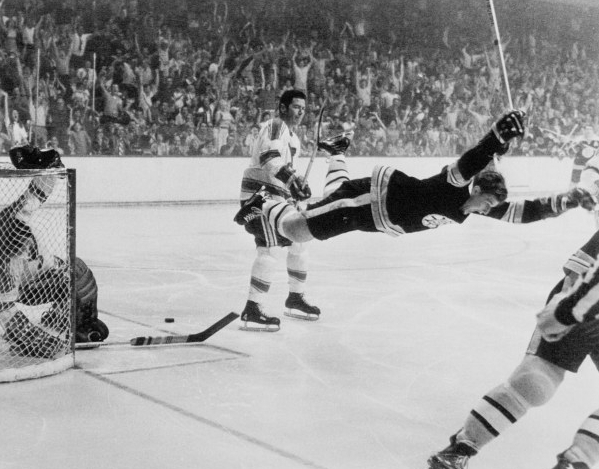 Bobby Orr flying through the air is one of the most familiar images in Stanley Cup history. The Stanley Cup Finals are now set as the Philadelphia Flyers and the Chicago Blackhawks begin their championship series on Saturday. 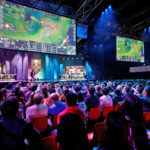 The Stanley Cup is the oldest championship trophy in North American professional sports and has produced many epic moments in the final series for Lord Stanley’s Cup. The Ducks were leading Game 6 by the score of 3-1 in the second period when captain Paul Kariya is laid out by Devils defensemen Scott Stevens and is taken back to the locker room with an apparent concussion with 13:48 left in the period. Kariya returns to the bench and 11 minutes after the hit he scores a goal as the Ducks would go on to win Game 6 by the score of 5-2 to force a Game 7 which they would lose 3-0. Montreal sweeps the Toronto Maple Leafs to win their fifth consecutive Stanley Cup, a record that has not been matched in NHL history. It is also the last Stanley Cup for the legendary Canadians right winger Maurice “Rocket” Richard. Mario Lemieux scores a breathtaking goal as he goes coast-to-coast beats two Minnesota North Star defensemen to put one into the net for a goal in the Penguins’ 4-1 victory in Game 2 as the Penguins would go on to win the series in six games for the franchise’s first Stanley Cup. 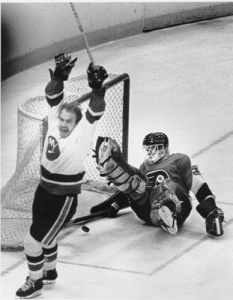 Bob Nystrom's goal in the 1980 Stanley Cup Finals started a dynasty for the Islanders. Islanders defenseman Bob Nystorm redirects left winger John Tonelli’s cross ice pass and puts it in behind Flyers goalie Pete Peeters for the game-winning goal 7:11 into the overtime period of Game 6, to clinch the first of four straight Stanley Cups for the Islanders. Game 3 of this series was played in a heavy fog as hot temperatures in Buffalo causing a vapor so thick that players had very little or no visibility of the puck. Also in this game, Sabres center Jim Lorentz killed a bat that flew across the rink. By the way, Buffalo won this game 5-4 in overtime. With three minutes left in the second period and the score tied 3-3 in Game 4, the lights in the Boston Garden go out and do not come back on, leading to the cancellation of the rest of the game and forcing a replay of the fourth game in Edmonton. The Oilers would win that replayed Game 4 to clinch their fourth Stanley Cup in five years. Two years later, the lights went out again in the Boston Garden during a Stanley Cup Finals game between the Oilers and the Bruins, but this time the lights come back on to complete the longest game in Stanley Cup Finals history. Oilers winger Petr Klima, only on his sixth shift of the game, scores the game-winning goal with 4:47 to go in the third overtime to give Edmonton a 3-2 victory in Game 1 of this series. The Oilers would go on to win the series in five games. Patrick Roy hoisted the Stanley Cup for the Canadians and the Avalanche. Avalanche goalie Patrick Roy and Panther goalie John Vanbiesbrouck engage in a epic scoreless duel that is not decided until the 4:31 mark of the third overtime when Avalanche defenseman Uwe Krupp scores on an unassisted goal to give Colorado a 1-0 victory and completing a sweep of the Florida Panthers to give the Avalanche their first ever Stanley Cup. In the game, Roy stops all 63 shots he faced while Vanbiesbrouck stops 55 shots before he gives up Krupp’s goal. The Philadelphia Flyers defeat the Boston Bruins in six games to become the first expansion team to win the Stanley Cup. Detroit winger Tony Leswick dumps the puck into the Montreal zone where it deflects off the stick of Canadians defensemen Doug Harvey and past goaltender Gerry McNeil for a goal 4:29 into the overtime period of Game 7 to give the Red Wings a 2-1 victory and the Stanley Cup. Since this game, there have been no Game 7s in the Stanley Cup Finals that have been decided in overtime. While the series only lasts five games, each game goes into overtime, ending when Maple Leafs defenseman Bill Barilko scores the Stanley Cup-clinching goal 2:53 into the overtime period of Game 5 to secure Toronto’s fourth Stanley Cup in five years. In the summer, Barilko would die in a plane crash but his body and the wreckage would not be found for 11 years, the same amount of time it took the Maple Leafs to win their next Stanley Cup. After 22 seasons in the NHL (20 of them with the Boston Bruins), Colorado Avalanche defensemen Ray Bourque wins his first Stanley Cup as the Avalanche defeat the defending champion New Jersey Devils in Game 7. Bourque would retire in the off-season. Marc-Andre Fluery helped lift the Penguins to the 2009 championship. 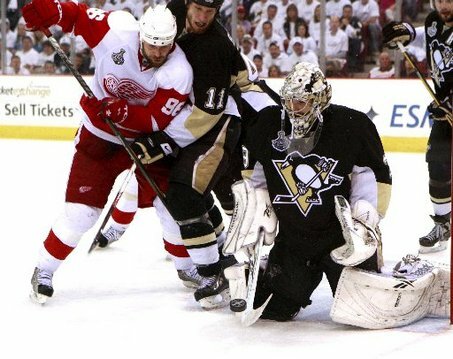 Penguins goalie Marc-Andre Fluery makes a diving save on Red Wings defense Niklas Lidstorm’s shot with two seconds left in regulation to preserve a 2-1 victory in Game 7 as the Penguins become the first professional sports team in 30 years to win a Game 7 of a championship series on the road. Canadians goaltender Ken Dryden completes a remarkable playoff run as he makes several key saves to help his team come back from a 2-0 deficit as Montreal scored three unanswered goals to defeat the Chicago Blackhawks and clinch the franchise’s 18th Stanley Cup. Dryden, who had only started six games during the regular season, wins the Conn Smythe Award as MVP of the Playoffs and would go on to win five more Stanley Cups and win the Veinza Trophy, the award for the best goaltender in the league, five times. The most disputed goal in Stanley Cup Finals history occurs with 5:09 left in the third overtime period of Game 6 of the Finals between the Buffalo Sabres and the Dallas Stars. Stars winger Brett Hull puts one past Sabres goalie Dominik Hasek with his skate in the crease before he held possession of the puck which was illegal during the 1999 season. However, the referees ruled that Hull established possession of the puck before his entered the crease and allowed the goal giving the Stars a 2-1 victory and clinching the franchise’s first Stanley Cup. Detroit left winger Pete Babando scores the Stanley Cup clinching goal 8:31 into the second overtime of Game 7 to give the Red Wings a 4-3 victory over the New York Rangers and secure the first of four Stanley Cups in six years for the Red Wings. 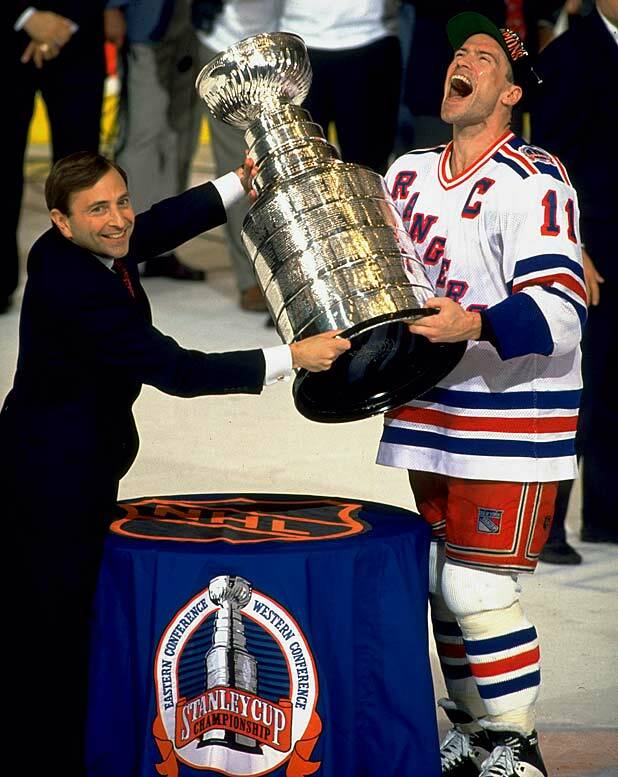 Mark Messier helped the New York Rangers end a 54-year Stanley Cup drought. The New York Rangers end a 54-year Stanley Cup drought as they survive three face-offs in their own zone in the last 37 seconds to defeat the Vancouver Canucks 3-2 in Game 7, setting off a wild celebration in Madison Square Garden. At the halfway point of the third period in Game 6 and the score tied 3-3, Maple Leafs defenseman Bob Baun slides onto the ice to block a Gordie Howe shot, which hits Baun in the leg and breaking his ankle. Baun left the ice on a stretcher but after freezing and taping the leg, Baun come back onto the ice and scored the game-winning goal 2:43 into the overtime period to give Toronto a 4-3 victory and forced a Game 7 back in Toronto. Baun played the entire Game 7 as the Maple Leafs defeated the Red Wings 4-0 to win the Stanley Cup. The Toronto Maple Leafs became the first team in professional sports history to come back from a 0-3 deficit and win a playoff series. The Maple Leafs would outscore the Red Wings 19-7 in the last four games to win the Stanley Cup and become the only team to make the 0-3 comeback in a championship series. Bruins defenseman Bobby Orr scores the most famous goal in NHL history as the Boston Bruins sweep the St. Louis Blues to win the Stanley Cup for the first time in 29 years for Boston. The goal occurs in Game 4, only 40 seconds into the overtime period, when Orr slid in front of the net and took a pass from Derek Sanderson, to put the puck past Blues goaltender Glenn Hall for a 4-3 victory and clinch the Stanley Cup for the Bruins. As Orr put his arms into the air as the puck went into the net, he was tripped up by Blues defenseman Noel Picard, sending Orr into the air. The image of a horizontal Orr flying in the air is one of the most famous pictures in all of sports.